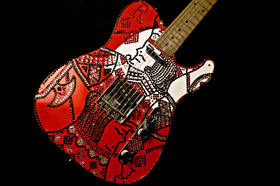 Guitars belonging to Bruce Springsteen, Jeff Beck, Keith Richards, Jimmy Page, Eric Clapton, and many more, are featured. Foreword by Les Paul. MONTCLAIR, N.J., September 3, 2014 – Hal Leonard Books will release a softcover edition of 108 Rock Star Guitars by photographer/author Lisa S. Johnson on November 11, 2014. This exquisite book, originally issued as an embossed, red leatherette-bound hardcover in limited quantity that USA Today called, “…a monster of a coffee table book…” will now be available to a much wider audience at a more affordable retail price of $54. 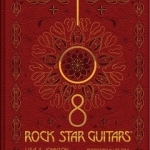 Eric Clapton, Bruce Springsteen, Jimmy Page, Keith Richards, Jeff Beck, Nancy Wilson, Bonnie Raitt, Slash, Carlos Santana, Jack White, Ronnie Wood, Lou Reed, Ace Frehley, Billy Gibbons, Don Felder, Joe Walsh, Robby Krieger, Willie Nelson, Johnny Winter, and Les Paul, who also wrote the foreword, are among the rock stars whose instruments are featured. The softcover, with French flaps, includes many of the same features of the original book in a slightly smaller size (9×10.5”): 396 pages, 486 gorgeous color images, reproduced using a six-color printing process, on high quality paper, and cover art that replicates the hardcover’s award-winning design. 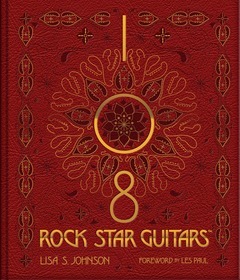 In 108 Rock Star Guitars, Johnson’s extreme close-up images capture the intimate details of her six-string subjects in a fresh and distinctive way revealing the beauty and art in these magnificent instruments, and giving insight into the personality of the musicians who play them. 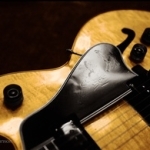 Additionally, she provides personal anecdotes describing her 17-year quest to photograph these guitars and documents her travels from the backstage hallways of some of the world’s most famous venues to the artists’ private homes. Lisa S. Johnson grew up in an artistic family, where she fell in love with melody and imagery and pursued a career in photography. 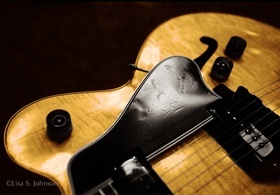 After a successful 10-year stint working at Eastman Kodak, she met the owner of a vintage guitar shop in Memphis, Tenn., and began exclusively photographing guitars. She lives in Las Vegas. 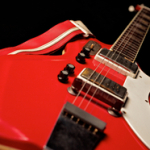 Les Paul was a guitar player, inventor, and recording artist, and an innovator throughout his career. 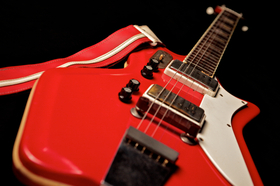 In 1941, he built his first solid-body electric, helping shepherd into existence rock music as we know it. A pioneer whose name graces some of the most beloved six-strings ever manufactured, Paul died in Mahwah, N.J., where he had spent much of his life, in 2009 at the age of 94. 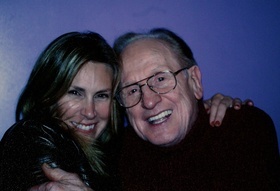 The mission of the Les Paul Foundation is to honor and share the life, spirit, and legacy of Les Paul by supporting music education, engineering and innovation as well as medical research. 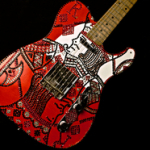 The foundation awards grants to music, music engineering and sound programs that serve youth, establishes music-related scholarships at schools and programs for students, provides grants for medical research and programs related to hearing impairment, and supports public exhibits displaying Les Paul’s life achievements. http://www.lespaulfoundation.org/.